To install Baqend, just add our CDN-hosted script in your website (available both over HTTPS and HTTP). For additional setup information visit our GitHub page. Tip: If you use our Starter Kits the Baqend SDK is already included and you can skip this setup. Note: It is generally a good idea to use the latest SDK version from //www.baqend.com/js-sdk/latest/baqend.min.js in development to always be up-to-date. In production, however, you should use the last exact version you tested with. Be aware that otherwise minor changes in a newly released version may break parts of your production application. See our latest changes to the SDK. To see that Baqend is working, paste the following after the Baqend script tag. It will replace the HTML body with 5 raw todo items from the tutorial application. Delete the snippet afterwards. The Baqend SDK is fully compatible with Node.js. This means you can use the SDK in a Node.js-based application for saving data, logging in users, etc. Additionally Baqend modules and handlers are based on Node.js and run and scaled automatically by Baqend. To install the SDK for a Node.js project do an npm install --save baqend and use require('baqend') in your code. The Baqend SDK is compatible with Require.JS, Browserify, ES6 and TypeScript and all majors build tools (Gulp, Grunt, Webpack, NPM scripts, etc.). If your app is hosted on Baqend, you do not have to specify any parameters, since the SDK will automatically detect and use the domain and protocol over which the page is served. You can pass a callback as a second argument, which will be called when the connection is successfully established. Behind the scenes Baqend is requested, the metadata of your app is loaded and the Data Models are created and initialized. If you want to register the handler afterwards, you can use the ready method to wait on the SDK initialization. If you are familiar with Promises you can alternatively use the returned promise instead of passing a callback. This works for all places in the Baqend SDK that exhibit asynchronous behaviour. Tip: Baqend not only gives you APIs for serverless development but also hosts and accelerates your assets, like HTML, CSS, images, etc. See Hosting for more details. After the Baqend SDK has been successfully initialized, all defined classes can be accessed using the DB instance. Just use the name of the class to access the object factory. The constructor accepts one optional argument, which is a (JSON-)object containing the initial values of the object. The object attributes can be accessed and changed by their names. Promises are a programming paradigm to work with asynchronous code. Primarily used for communication and event-scheduled tasks it makes code much more readable then the callback-based approach. A Promise represents the public interface for an asynchronous operation and can be used to chain tasks that depend on each other. 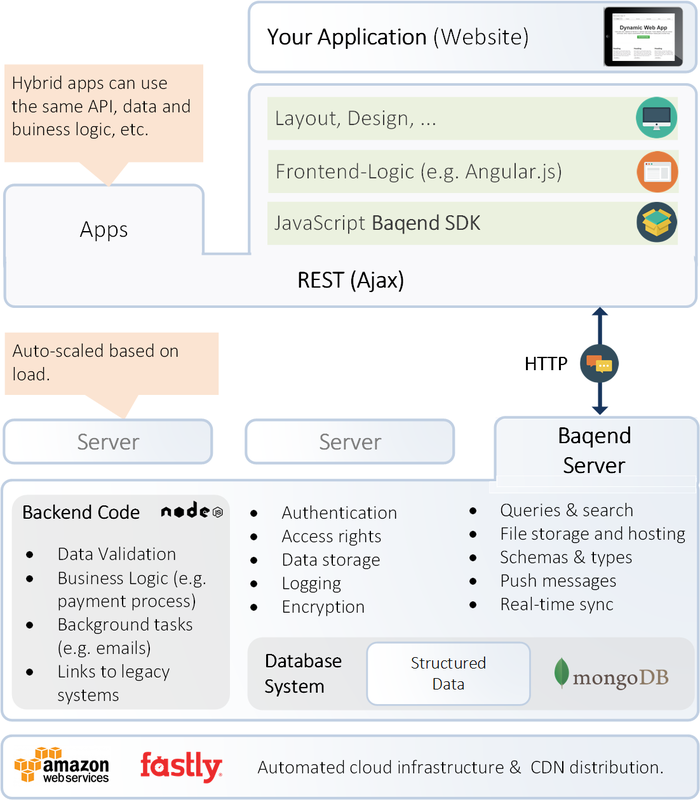 The Baqend SDK supports both paradigms, therefore each asynchronous method accepts an optional success and an error callback and returns a Promise for further tasks. Basically there are two common ways to initialize a Promise. You can create a new instance of a Promise with an executor function. With the given resolve and reject function it can decide if the promise should be fulfilled with a given value or should be rejected with an error. The second way is to create an already resolved Promise with a given value. If you want to listen for the outcome of such a promise you can register a onFulfilled and a onRejection listener with the then(onFulfilled, onRejected) method of the promise. When the promise gets resolved, the onFulfilled listener is called with the fulfilled value. In case of rejection the onRejected listener is called with the error. The Promise.then method returns a new promise which will be resolved with the result of the passed listener. The listener itself can also perform asynchronous operations and return another promise which will then be used to resolve the outer Promise. For additional examples and a more detailed explanation consult the MDN Promise Documentation. Dynamic and static Websites built with any tools of your choice. We recommend single page applications for the best user experience. Boilerplate projects and frontend generators to get started easily: Bootstrap and Intializr give you nice boilerplate projects, yeoman generates many different frontend projects, Google has released a web starter that contains a cross-device boilerplate project and useful gulp tasks for live reloading, releasing, etc. Baqend Cloud hosts your application data and business logic and delivers it over a global caching infrastructure for performance at the physical optimum. The Baqend dashboard is the main tool, which you will use to manage and configure your Baqend instance. After you have created your first app, you have in the left navigation bar a quick overview over all the configurable and usable functionalities of Baqend. Baqend Modules - can be used to create Baqend code, which can later be called by your app to execute trusted business logic. See also Baqend Modules. By clicking the + you can create new modules, Afterwards a module code template will be opened. Additionally you can create a new custom classes with a click on the + button near the Data label. Type a none used name and hit enter. The schema view will appear and you can begin to model your own class schema. Logs - Here you can view the logs generated by accessing the api and your application logs. API Explorer - The API Explorer provides a GUI to serve the underlying REST API of Baqend. Here you can explore and made direct HTTP calls to your Baqend server.